Unique One Page portfolio for design directory Sylvain Theyssens featuring a footer of scrolling projects (each linking out to Behance) and a slick off-canvas About panel. 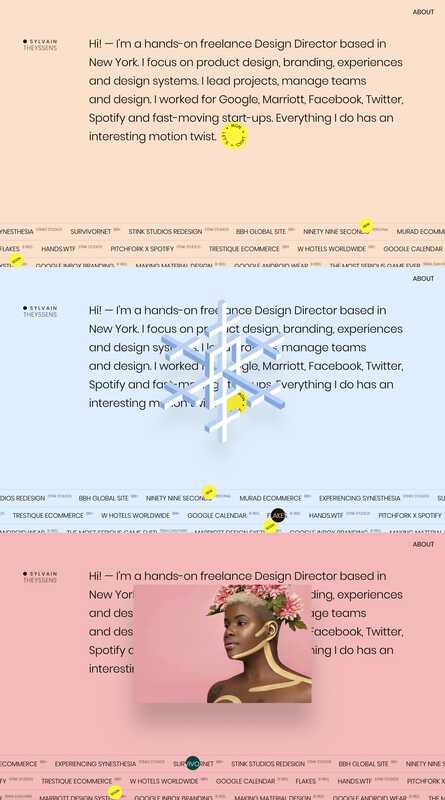 I’m a freelance Design Director with a focus on product design, branding, experience and design systems. I both directed and worked hands-on for Google, Marriott, Facebook, Twitter, Spotify and fast-moving start-ups. Everything I do has a motion twist.